Simplify 3D is a great and very powerful slicer and offers a multitude of parameters you can use to tweak your printers output. Rather than walking you thru the typical settings available in various youtube videos and on the Simplify 3D website I thought I would share some of my tips and tricks. One of my favorites is the Extrusion width setting. With this setting you can fine tune the layers based on the dimensions of your object being printed. Follow along and see some examples of how this setting can give you variations in the outcome of your printed surface especially near areas where perimeters meet. In this next illustration there are 4 models that are all the same measuring 3x3x100mm on the print bed. each have different extrusion widths applied. Let’s change subject for a brief moment… For owners of the MK2 at the beginning of a print a starting script caused the nozzle to run a purge strip to prime the nozzle. Have you ever noticed that even though you are printing with a .4 nozzle the test purge strip is far wider than the .4 nozzle. The Extrusion width does something similar. It manipulates the extrusion multiplier to either under extrude or over extrude in a conditional manner. Now, how does an objects size effect how it prints.Here’s my example… Let’s say you have an object that is 8mm in width and you are printing it with a .4 nozzle. But did you know that with a .4 nozzle we can also print at .5 extrusion width. Yup we sure can. With the .5 extrusion width we’re going to send a touch more plastic down a tad slower so it in effect backs up on itself widening the stream. Notice how with the .5 extrusion width the lines of the perimeter migrate more towards the center making the top later area to be filled smaller. limitations as to how far you can push this. 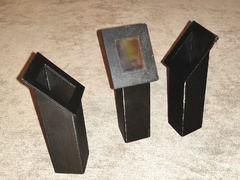 The general idea is to print in increments of your objects size or of areas you would prefer to turn out best based on the overall expectations you have for the final quality. So with that, have a look at an example of the below objects printed with several extrusion widths. The orientation of the image below is 180 degrees opposite of the illustration above based on where I had to stand to take the photo. Apologies. I could rotate it but then it would be oriented in an equally confusing fashion. One of my favorites is the Extrusion with <= Shouldn't it be WIDTH ? Why didn’t you just use some simple image manipulation program to rotate it? Hmmmmmmm. Interesting! Thank you! I will try this! 3D Slicer Settings That Will Save Your Prints!